Acon - Inbar (27.05.2018) - World Stamp Championship - Israel 2018. Machines 01801 + 01802 + 01803 - Special codes postal kiosks installed at the stamp exhibition. First day cover with the three designs available at the exhibition (NIS 2.50 + NIS 2.50 + NIS 7.40). First day pictorial postmarks. Acon - Inbar (27.05.2018) - World Stamp Championship - Israel 2018 (Jerusalem light rail, tramway). Machines 00001 + 01801 - Special code postal kiosk installed at the stamp exhibition. Pictorial first day cover with two ATMs, domestic mail (2 x NIS 2.50). First day pictorial postmark. Acon - Inbar (27.05.2018) - World Stamp Championship - Israel 2018 (Jerusalem light rail, tramway). Machine 00001. Mint ATM, domestic mail (NIS 2.50). Acon - Inbar (27.05.2018) - World Stamp Championship - Israel 2018 (Jerusalem light rail, tramway). Machine 00001. Pictorial first day cover with ATM, domestic mail (NIS 2.50). Acon - Inbar (27.05.2018) - World Stamp Championship - Israel 2018 (Jerusalem light rail, tramway). Machine 00001. Maximum card with ATM, domestic mail (NIS 2.50). First day pictorial postmark. Acon - Inbar (27.05.2018) - World Stamp Championship - Israel 2018 (Jerusalem light rail, tramway). Machine 00001. Mint button set six values (NIS 2.50 - 4.10 - 6.50 - 7.40 - 8.30 - 9.00). Acon - Inbar (27.05.2018) - World Stamp Championship - Israel 2018 (Jerusalem light rail, tramway). Machine 00001. Souvenir leaf with ATM, domestic mail (NIS 2.50). First day pictorial postmark. 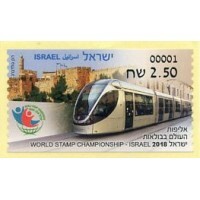 Acon - Inbar (27.05.2018) - World Stamp Championship - Israel 2018 (Jerusalem light rail, tramway). Machine 01801 - Special code postal kiosk installed at the Israel 2018 stamp exhibition. Mint ATM, domestic mail (NIS 2.50). Acon - Inbar (27.05.2018) - World Stamp Championship - Israel 2018 (Jerusalem light rail, tramway). Machine 01801 - Special code postal kiosk installed at the Israel 2018 stamp exhibition. Mint ATM, domestic mail (NIS 2.50) + receipt. Acon - Inbar (27.05.2018) - World Stamp Championship - Israel 2018 (Jerusalem light rail, tramway). Machine 01801 - Special code postal kiosk installed at the stamp exhibition. Pictorial first day cover with ATM, domestic mail (NIS 2.50). First day pictorial postmark. Acon - Inbar (27.05.2018) - World Stamp Championship - Israel 2018 (Jerusalem light rail, tramway). Machine 01801 - Special code postal kiosk installed at the Israel 2018 stamp exhibition. First day cover mailed to Spain (NIS 7.40). Acon - Inbar (27.05.2018) - World Stamp Championship - Israel 2018 (Jerusalem light rail, tramway). Machine 01801 - Special code postal kiosk installed at the stamp exhibition. Maximum card with ATM, domestic mail (NIS 2.50). First day pictorial postmark. Acon - Inbar (27.05.2018) - World Stamp Championship - Israel 2018 (Jerusalem light rail, tramway). Machine 01801 - Special code postal kiosk installed at the stamp exhibition. Maximum card with ATM, domestic mail (NIS 2.50). First day date postmark 'Jerusalem'. Acon - Inbar (27.05.2018) - World Stamp Championship - Israel 2018 (Jerusalem light rail, tramway). Machine 01801 - Special code postal kiosk installed at the Israel 2018 stamp exhibition. Mint button set six values (NIS 2.50 - 4.10 - 6.50 - 7.40 - 8.30 - 9.00).